Good news first, Brian is home! And he had some great contacts with Dayton area people. Praise God. We looked at two duplexes today. We chose one to rent and filled out the application and signed and paid for a credit check. We had a difficult time explaining the whole money thing–or lack of. The people who own it go to our church–but haven’t been for awhile–so pray for mercy and grace. Pray that our credit score is still good!!!!! We left really discouraged and stressed. God continues to provide for us and through this last week of Brian being in Ohio, God provided enough money to pay for the first month’s rent. The other two months, we are planning to use savings. Then, hopefully in January we will be on GBIM support. AHHHHHH–I feel stressed typing all that. I think I need to pray some more—my faith is lacking right now. I’m getting sick of this crying thing. The last few days I’ve cried several times a day. Friday and Saturday it was movies that made me cry. Today–we got home from church and I was sooooooo hungry. I made lunch for the boys, but nothing seemed appetizing to me. All my pregnancies I’ve had this problem and then I get hungier and hungrier looking through the cupboards, fridge, and freezer and getting light headed and shaky. So today I just cried. I was so hungry and didn’t want to fix anything because nothing sounded good. Then I was reminded of a baked potato with cheese, sour cream and broccoli and it sounded wonderful and it was easy to make. Just now my mom brought some lasagna and chocolate chip cookies to me. Now I don’t have to worry about dinner–although I was thinking of that same baked potato for dinner. So I’m ready for the next hormonal shift–to being normal!!! Well, it ended up successful. The pictures at JCPenny’s turned out great–but I didn’t think we’d get any. Elijah refused to sit down –he kept crying. Malalachi resisted too, then I bribed Malachi with fruit snacks. I did the old suitcases and a teddy bear–but they wouldn’t wear the hats. We did eventually get one with both of them and one with Elijah by himself. I did the sepia coloring and it looks sooooo adorable. I wish I could show you–once I get them I’ll try to show them off. I don’t know how to download our pictures from the camera to the computer so pictures of their haircuts will have to wait until Brian can instruct. Yesterday I was walking on the boardwalk and I ran into my second grade teacher–whom I haven’t seen since elementary school. The only way I knew it was her was because she had a name tag on to re-elect her as a judge in the county. I remember her being a lot taller. My mom is having a yard sale tomorrow—I’m gonna try and sell some things, so I’m off to price items. I cut Malachi and Elijah’s hair. It always is so much easier to manage after a cut. This is the shortest I’ve cut Elijahs. He looks soooo big now. I used the clippers and used the 1/2 inch in the back and around his ears. He doesn’t have little wings anymore that look so cute. They are getting pictures taken tomorrow and there’s always a dilemna of what should they wear–I still have another 20 hours to decide. Brian’s having some good contacts with churches in the Dayton area–some prayer partners and some financial support too. Praise God!! Next week we are going to look at several rentals–I’m really excited. I feel like living in my parent’s basement has made me revert back to a teenager in some emotional ways. I just want to get out!!!!!!!!!!!!!!! I want my own space, my own furniture and own decorations–not old china cabinets and scary knick knacks staring me down. Not to mention the smell of urine and mildew and mold that engolfs the basement. So–relief is in sight, at least physically, but not financially. God has never ceased to take care of us. I know this sounds really cheesy–but I was pumping gas earlier today and I saw this little birdie 2 feet away from me eating crumbs from the ground. God reminded me he takes care of the sparrows, he will continue to provide for the needs of my family. Elijah started saying “love you” yesterday and he’s also saying “please”, not just signing it anymore. We’re working on thank you. Malachi wants to hear the same books over and over again–which can be tiring! I have so many memorized now, and he’s starting to memorize them too. Yesterday he was looking through a book and “reading” what was on the pages–it was awesome. He’s also started looking through books and “spelling” the words on the page. He says random letters for each page. I love watching them learn so much–it is soooo amazing. Hey Deb–was Ellie’s birthday the 20th or 21st? Happy Birthday Ellie! Hi Sara—your boys are so precious! How old are they? Scoop: (talking toy from Bob the Builder) Can we dig it? Elijah: Dig it! Dig it! Malachi: Can we dig it? Yes, we can! 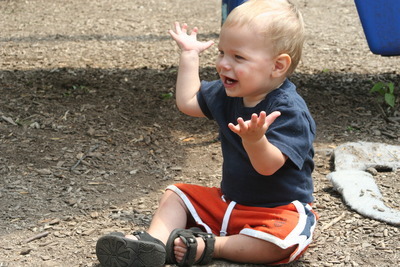 The excitement from the onlooker is, Elijah is saying more phrases and Malachi is speaking in sentences! It is so fun. 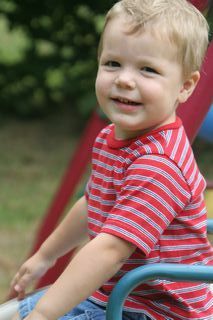 I am going to try this week to get Elijah’s 1 year pictures taken–he’s 15 months. I’m slacking off!!!! There are some memory things I never did for Malachi because I knew I wouldn’t be able to keep up with it for the next four kids we’d have, but I thought I’d be able to keep up with getting pictures taken, oh well. Malachi and Elijah have started tackling each other–a 2 year old and a 14 month old tackling each other is hilarious. Tonight while we were walking on the boardwalk we were talking to another couple and they asked our kid’s their names and Brian says Elijah pointed to himself and said his name!!! I didn’t hear it. 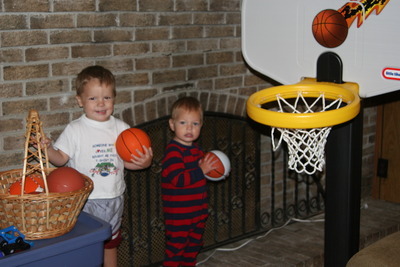 Malachi and Elijah playing ball. I will be so thrilled to see this all work out and I did it by myself with out Brian’s help. He’s the technological one who sets these things up for me. I had my first doctor’s appt today for baby #3. It was great to hear the baby’s heartbeat. I was surprised at how much I weighed, five pounds less than I thought. That’s always encouraging. I’m due April 2nd–11 weeks. Hopefully I figure out how to put some pictures on here.